The parents of 19 young children were already deported, and the whereabouts of parents of another 19 are unknown. WASHINGTON — Government lawyers said Friday that they cannot locate the parents of 38 migrant children under the age of 5, as a federal judge indicated he is open to extending the deadline for reuniting nearly 3,000 children separated from their mothers and fathers while crossing the US-Mexico border. In a status hearing with U.S. District Judge Dana Sabraw of the Southern District of California, who ordered the reunification, government lawyers said the Health and Human Services Department would only be able to reunify about half of approximately 100 children under the age of 5 by the court-ordered deadline of July 10. 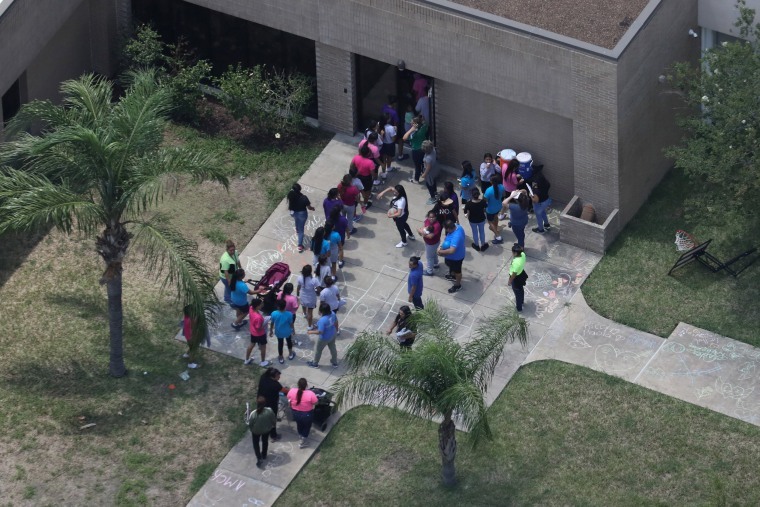 For 19 children, their parents have been released from custody into the U.S. and their whereabouts are unknown. The parents of another 19 children have been deported. "The way [a family separation] is put in the system is not in some aggregable form, so we can’t just run it all," said Sarah Fabian, the Justice Department attorney representing the government before Sabraw. Sabraw said he would agree to delay the deadline for reunifying the youngest children if the government could provide a master list of all children and the status of their parents. Sabraw ordered the administration to share a list of 101 children with the American Civil Liberties Union by Saturday afternoon. The judge scheduled a status conference for 10 a.m. Pacific time on Monday. A government lawyer said she could not attend a status conference over the weekend because she had out-of-town dog-sitting responsibilities. "The government must reunite them," Sabraw said. "It must comply with the time frame unless there is an articulable reason." In a court filing, attorneys for the U.S. government claimed the court mandate for returning all children under 5 to their parents by July 10 and all other children by July 26 does not account for the time required to verify and vet each parent. "The government does not wish to unnecessarily delay reunification," lawyers for the Justice Department said in their response to the court. "At the same time, however, the government has a strong interest in ensuring that any release of a child from government custody occurs in a manner that ensures the safety of the child." Sabraw said he understood the government was acting in "good faith” by raising issues that could affect the timing, but said the “goal here is for reunification” and cautioned that the government should not resort to appealing his decision to reunify. Sabraw said he was prepared to grant additional time if the government could provide a master list of the children under 5 who had been separated from their parents with information on the whereabouts of their parents and any difficulties they may have in locating them. Health and Human Services Secretary Alex Azar said Thursday that his agency is using DNA testing to confirm parent-child relationships for nearly 3,000 children. The Justice Department argued that inconclusive DNA tests can delay reunification, as can the work necessary to make sure children are going to parents who are fit to care for them. Alternatively, the court could clarify its mandate by allowing the vetting process to be shortened, the government argued. "If the court concludes that HHS must truncate (the vetting) process to meet court-ordered deadlines, then the court should so order in a manner that provides HHS full clarity," the government lawyers argued in the filing. Sabraw said HHS “should not feel obligated to comply with those internal procedures” that were put in place to match children who had arrived at the border alone because the parents represented in the lawsuit arrived at the border with their children. The response also asked the judge to clarify how many children it should be seeking to reunify. President Donald Trump's "zero tolerance" policy requiring every immigrant crossing the border illegally to be prosecuted and therefore separated from any children went into effect in early May, but HHS interpreted its mandate to mean that children separated before the policy went into effect should also be reunited. Trump signed an executive order June 20 ending separation. The government also argued that it was too difficult to find parents who have already been deported back to their home countries, asking the judge to extend the timeline to find those parents or exclude them from the population who must be reunified. Sabraw also said that his order for the government to reunify children does not mandate how the government releases or detains immigrants. The Trump administration had argued that his order was in conflict with court decisions in 1997 and 2015 that mandated children be released from detention after 20 days and therefore justified their decision to detain them indefinitely.